Ancient Jemez pottery died out during the Spanish conquest of the southwest. It was revived in the 19th Century and today there are more than 500 Jemez artists working in clay. 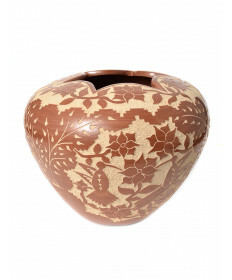 Jemez pottery is characterized by variety; storytellers, finely incised ware (some with blue slip), intricately painted geometrics and floral abstractions, and sculptural melon style pieces. 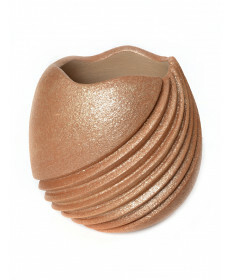 The clay body is red to cream and potters may polish the surface to a high sheen or leave it a rough matte. Cochiti Pueblo is located approximately 35 miles south of Santa Fe, New Mexico. 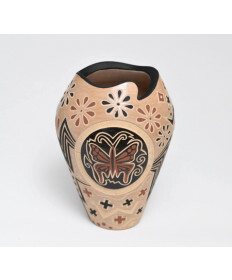 Cochiti pottery is characterized by a cream or gray slip over red clay with black line decoration. Cochiti pottery is frequently quite whimsical and since the late 19th Century, Cochiti has been known for figurative work ranging from animals, topical commentary to the iconic singing mothers. In the 1960's, Cochiti potter Helen Cordero created the first true storyteller figure, a seated male figure with several children hanging on. 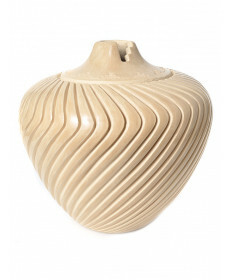 This form is now created by potters from many tribes and enjoyed by collectors around the world.